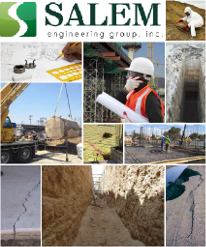 Land Use Planning – Salem Engineering Group Inc.
SALEM has been a leading provider in environmental and land use consulting services for more than 15 years. Our team of certified professionals have provided environmental consulting services for a diverse base of clients, including large-box retail store chains, major financial institutions, private investors and entrepreneurs, municipal districts, state and federal agencies, redevelopment agencies, medical facilities, institutions and correctional facilities, canals and irrigation waterways, single- and multi-family residential buildings and tracts, real estate developers and land owners, design professionals, among others. Each team member brings a specialized level of experience and expertise to their work, resulting in a cohesive approach to project management and successful project delivery. SALEM’s interdisciplinary team has conducted numerous Air Quality and Greenhouse Gas Assessments for proposed commercial and retail development sites in California and throughout the Western United States. SALEM’s team has years of experience working hand-in-hand with federal, state and local regulatory agencies on behalf of our clients. We understand the often complex regulatory morass and have an excellent track record of assisting our clients with compliance while minimizing costs. Energy conservation measures instituted during the 1970s and 1980s minimized the infiltration of outside air into buildings and contributed to the buildup of indoor air contaminants which lead to the common usage of the term “sick building syndrome.” The syndrome is a condition associated with complaints of discomfort including headache; nausea; dizziness; dermatitis; respiratory system irritation; sensitivity to odors; and fatigue. The specific causes of the symptoms are often unknown and are attributed to the effects of a combination of substances or individual susceptibility to low concentrations of contaminants. Indoor air contaminants typically include acetic acid; carbon dioxide; carbon monoxide; formaldehyde; nitrogen oxides; radon; volatile organic compounds; asbestos; and microorganisms and other biological contaminants including fungi, mold, bacteria and pollen. SALEM utilizes strategically aligned Certified Industrial Hygienists to conduct investigations of indoor air quality (IAQ) so our clients can quickly and cost effectively address employee complaints and concerns regarding the quality of the indoor air in the workplace. Based upon a combination of sampling and visual inspection our team of professionals will provide value engineering recommendations which are designed to prevent or alleviate the identified IAQ issues. SALEM utilizes strategically aligned partners to conduct Noise Studies in California and throughout the Western United States. The purpose of a typical Noise Study is to analyze the proposed development’s potential temporary noise impacts associated with construction activity and long-term noise impacts associated with the operation of the facility once construction is complete. The typical methodology utilized in noise assessments includes the collection of existing data from previously prepared studies and the local jurisdiction’s Noise Element, as well as the use of noise prediction models and the collection of field data. The Noise Study data is then utilized to provide noise mitigation solutions, if required. A Property Condition Assessment, commonly referred to as a PCA, is an assessment of the physical condition of a building and its systems (mechanical, electrical, plumbing, and heating & air conditioning) as well as its site improvements including parking lot, landscaping, pavement and other exterior features. In addition, the building and site improvements are examined for code compliance, life cycle including current and operational status, recommended replacements, and include an evaluation of its depreciation and capital expenditures. Typically, a PCA scope of work includes a site reconnaissance survey to evaluate the building, interior systems and site improvements; an interview with property owner and management team; a review of all available building permits/plans/violations; and issuance of a detailed report. © 2003 – 2017 Salem Engineering Group, Inc. All rights reserved.